Nothing says classic quite like an Atari reference! This groovy accent piece is the perfect replica of a pixellated space invader from the 80’s. He’s pretty thick so he stands on his own and as an added bonus he glows in the dark…how cool is that!? These are perfect for adding a little whimsy to your office or kids space…they won’t get it but not everything can be about them! All those hours of playing Space invaders will come flooding back when you look at it. The set includes three of these guys in different sizes. 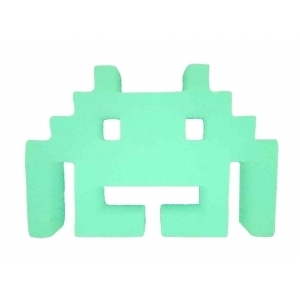 You can get your very own Space Invaders Glow In The Dark Shelf Decor set here.